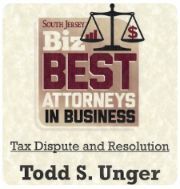 Tax Attorney NJ & IRS Tax Help | Attorney Todd S. Unger, Esq. Mr. Unger handles Federal Tax Controversy matters and is responsible for the firm’s New Jersey and New York State matters. Mr. Unger is a member of the Bars of the State of New Jersey, New York, Florida, and Pennsylvania. He is a member of the American Bar Association (Section of Taxation), New York State Bar Association (Section of Taxation) and a member of the Florida Bar (Section of Taxation). Mr. Unger is also licensed to practice in front of the United States Tax Court. Admitted in Florida and not licensed in New Jersey Practice limited to Federal Tax Matters Steven N. Klitzner graduated from the University of Miami School of Law in 1979 with a Juris Doctorate degree. 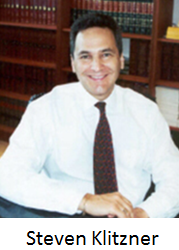 Mr. Klitzner is admitted to the United States Supreme Court, United States Tax Court, United States Court of Appeals for the Fifth Circuit, and the United States District Court for the Southern District of Florida. He has been awarded an AV rating by Martindale-Hubbell Law Directory, the highest rating of the publication. In 2005, the American Society of Tax Problems Solvers awarded Mr. Klitzner their Tax Practitioner of the Year Award. 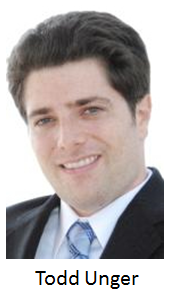 Mr. Klitzner has a separate private practice, located in North Miami Beach, Florida, that is devoted exclusively to tax problem resolution. Mr. Klitzner is a member of the American Society of IRS Problem Solvers. He is a Consulting Member of the Tax Freedom Institute, an association of tax professionals in defense of taxpayer rights. He is also a member of the Florida Bar Association, American Bar Association, Academy of Florida Trial Lawyers, and Association of Trial Lawyers of America. Call (877) 544-4743 to arrange a consultation with a New Jersey Tax Attorney or fill out a contact form!